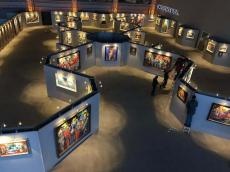 Art works of world-famous artist Sakit Mammadov have been showcased at Baku Crystal Hall. The exhibition is timed to the 60th anniversary of the national artist, Trend Life reported. Mammadov won the hearts of thousands by his mastery of painting. He can even be called a master of colored paints, bringing light to darkness, calmness to anxiety and inspiration to reluctance. The works of Sakit Mammadov are among those that collectors want to get with great pleasure at the world museums, galleries, and the auctions. The name of the famous Azerbaijani artist is well known to art lovers far beyond the borders. His works are exhibited in many prestigious galleries of the world. Artist's paintings are exhibited in the galleries of Germany, France, Italy, Turkey, Belgium, Russia, Czech Republic, Sweden, Poland, Austria, Hungary, Australia and other countries. Addressing the event, Deputy Prime Minister Ali Ahmadov, First Deputy Minister of Culture Vagif Aliyev and others stressed the great contribution of Sakit Mammmadov to the development of national art and its propaganda abroad. The exhibition presents more than 150 works of artist. These colorful paintings are different, but all of them are combined by opal colors - pale pink and blue. Sakit Mamamdov believes that a person should search for life and strive for development. "The main reward for me is the talent that the God awarded me, without him I would not take place as an artist," artist said. Sun, passion and bright colors are the key tools of Sakit. His paintings are full of energy. They create good mood in their viewers. They are filled with generosity and lively spirit. Mammadov's painting helps the viewer to feel the world depicted through the artist's imagination. His paintings create a special atmosphere. At first glance, they might seem simple, but to look attentively, they seem more complicated and delicate. The works represent an excellent blend contrasts, being modern and traditional, powerful and delicate, complex and simple. Sun, passion and bright colors are the key tools of Sakit. His paintings are full of energy. They create good mood in their viewers. They are filled with generosity and lively spirit. A portrait of Pope John Paul II can be definitely called one of the artist's most famous paintings, as it brought Mammadov many proposals from Italy, Turkey and Georgia. Mammadov, however, rejected all these offers, because no one would know that the picture was painted by the Azerbaijani artist. And he was right. Now, this picture is being hung in the Vatican Museum. It has been donated to Pope on behalf of the Republic of Azerbaijan. As a member of UNESCO Union of Artists, Mammadov pays special attention to Azerbaijan's culture. Seeking to continuously improve his works, Sakit believes that it is necessary to strive for world recognition. An interesting offer to the artist was associated with a Monica Bellucci's portrait. After he completed the work, the artist received an offer to draw the gorgeous actress naked. The client said that they would pay a large amount of money to get the picture, which they would present to Bellucci herself. However, the artist rejected the offer, saying that he could do it only after the actress's approval. Opalism is a school, a style the foundation of which was laid by academic artist Sakit Mammadov. Opalism word’s etymology was taken from the opal stone. The warm color pattern in opal had won Sakit Mammadov’s admiration from the youth. Almost in all his works the colors of stone is found. The fact of proud is that the Opalism school created by Sakit Mamedov is presented by the students of the artist with high professionalism. The exhibition will run until March 25.